I can’t believe I waited so long to pick my crochet hook back up! I’m really enjoying making these afghans. 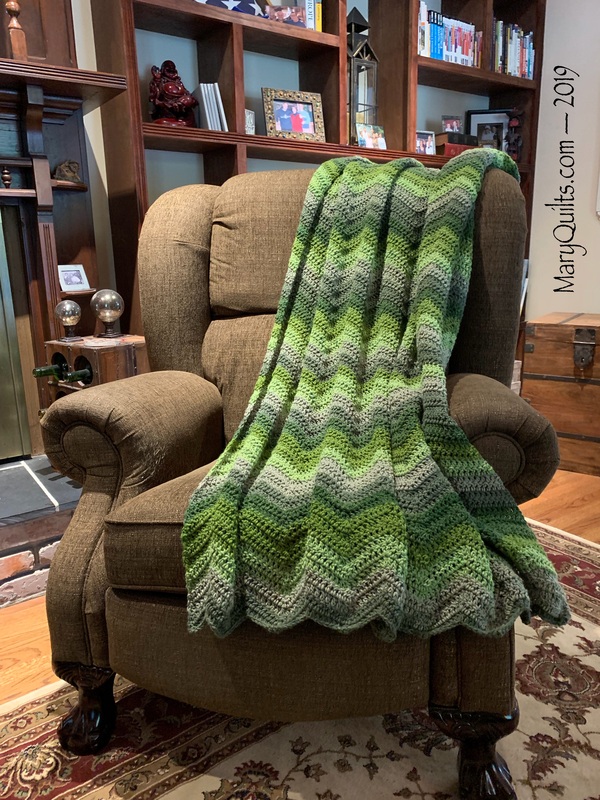 Started exactly one week ago, the green Ripple Afghan is done and I really, really like it. I’m so tempted to run right out and buy more of this yarn (Caron Big Cake) to start another one but I’ll work a little longer with stash yarn before I allow myself to buy for the next Ripple. I’ve also changed my mind about hook size. After crocheting the first little bit of this one, I thought I’d go up a size hook for better drape on the next one … but the finished afghan is just right so I’ll stick with a size H hook with this pattern and yarn. It’s beautiful, Mary! What are the dimensions and how many skeins did you use? The colors are so pretty together. I love using yarn that is variegated like that because you don’t have to deal with as many knots and weaving in ends. I used about 2.5 cakes … maybe a little more. You could easily make it longer but I thought the this was ab up the right length for this one so stopped even though I had more yarn. So pretty! I used to crochet before quilting and made many ripple afghans. I used variegated yarn back then, and just love the look of the yarn that you have used on this. I’m with Sue! We need to know details about this beauty! It’s beautiful! I need to pick the one I was making back up. I love the Caron Big Cakes – I use them for prayer shawls for our church members going through difficult times. What size is this afghan, and did you use just one “cake”? What a beautiful afghan! Wish I knew how to crochet as i would not have the patience to knit anything this large. That afghan looks at home in that spot. I think it’s a keeper! Did you have more problems with cut knots in the Caron cake, like the 2 you mentioned in the beginning? This turned out beautiful!! I will be buying some “cakes” soon. That is the prettiest Afghan I have ever seen! The colors look so rich. It looks lovely on your chair. I love seeing all of your projects. Thanks for sharing what you are up to.